Click on the blue boxes below to see photos and videos and discover more about some of the manatees in our Adopt-A-Manatee program. The manatees either winter at Blue Spring State Park in Orange City, Florida or live at the Ellie Schiller Homosassa Springs Wildlife State Park in Homosassa, Florida. Many manatees have been injured by watercraft and bear scars from these collisions. Some scars are also from entanglement with fishing lines and ropes or from cold stress in the winter. Researchers, such as Wayne Hartley, Save the Manatee Club’s Manatee Specialist, identify manatees by their scar patterns as they study and record their behaviors. That’s how we know so much about the manatees listed below. 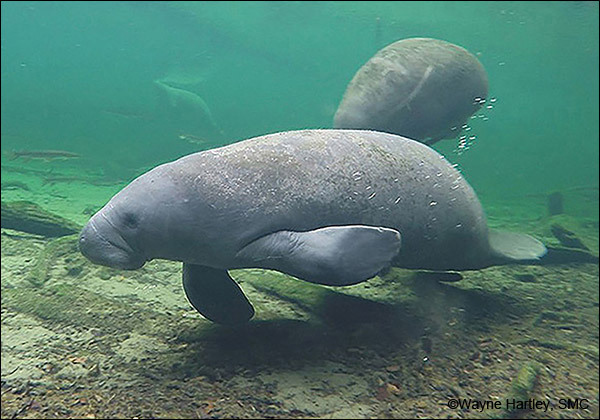 Funds from the Adopt-A-Manatee program are used to help protect imperiled manatees and their habitat. See the full list of manatees available for adoption and learn more about the program at the Adopt-A-Manatee page of our website. Rescued as an orphan, she has given birth at Blue Spring State Park four times! Annie at Blue Spring State Park on December 15, 2017. Annie was rescued as an orphan on August 12, 2005 from the Halifax River near Port Orange, Florida. At the time, she was just a little over four feet in length and weighed only 70 pounds. She was taken to SeaWorld Orlando to grow and gain weight. On the day she was released at Blue Spring State Park, Annie was much bigger than when she was rescued. She was about eight and a half feet in length and weighed 1,055 pounds. We are glad to report that Annie has adjusted well to living in the wild. Annie gave birth to her first calf in 2012 at Blue Spring. She had a second calf at Blue Spring in 2014, her third calf in 2016, and she recently gave birth to her fourth calf at Blue Spring in 2018! Annie is available for adoption, and each person who adopts her will receive a full-color photo, biography, and adoption certificate, as well as a membership handbook and subscription to The Manatee Zone, a newsletter featuring updates on the adopted manatees when they are sighted, and Paddle Tales, Save the Manatee Club’s bi-monthly eNewsletter. 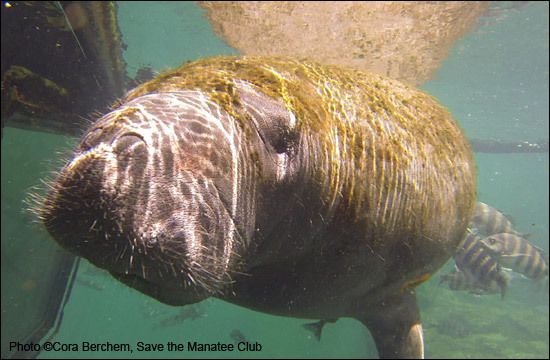 For more information about adopting Annie, go to Save the Manatee Club’s Adopt-A-Manatee page, or call 1-800-432-JOIN (5646). 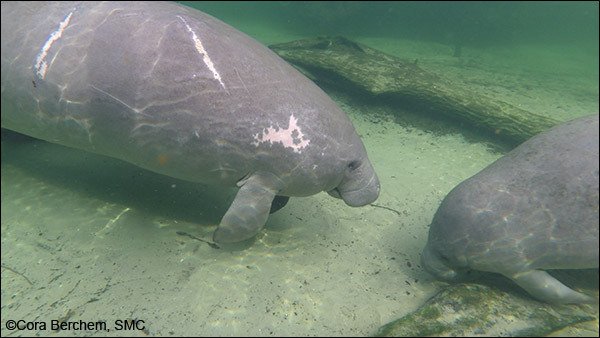 And be sure to watch for Annie and other manatees on the Blue Spring webcams at ManaTV.org and read updates from Manatee Specialist Wayne Hartley. Aqua is identified by the large white scar next to the three smaller scars on her left shoulder. Aqua is a female manatee and a winter visitor at Blue Spring State Park in Orange City, Florida. She was first given a Blue Spring identification on December 30, 2011. 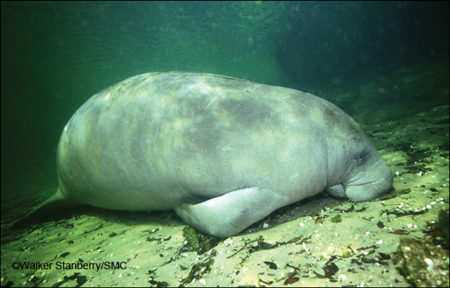 At that time, she was a medium-sized manatee estimated at five years old and had a complex but very faint scar pattern on her right rear flank. Since that time, she has received three propeller cuts over her left shoulder and a new, large, white scar next to the three propeller scars. That is chiefly how she is identified by manatee researchers. Aqua has had two calves: one in 2013 named Teal and another in 2015 named Fabio. Aqua is available for adoption, and each person who adopts her will receive a full-color photo, biography, and adoption certificate, as well as a membership handbook and subscription to The Manatee Zone, a newsletter featuring updates on the adopted manatees when they are sighted, and Paddle Tales, Save the Manatee Club’s bi-monthly eNewsletter. For more information about adopting Aqua, go to Save the Manatee Club’s Adopt-A-Manatee page, or call 1-800-432-JOIN (5646). And be sure to watch for Aqua and other manatees on the Blue Spring webcams at ManaTV.org and read updates from Manatee Specialist Wayne Hartley. Ariel cruises past the Fish Bowl underwater Observatory at the Ellie Schiller Homosassa Springs Wildlife State Park. When Ariel was just a few weeks old, she was rescued with her mother Amanda in Lake Worth Inlet, located along Florida’s southeastern coast. It was Christmas Day 1973, and Amanda had been hit by a boat and had bad injuries caused by the boat’s propeller. Luckily, Ariel was not injured. The pair was rescued, and Amanda was nursed back to health. In 1986 they were moved to the Ellie Schiller Homosassa Springs Wildlife State Park in Homosassa, Florida. Sadly, Amanda died in 2011 during a medical procedure, but Ariel still lives at the park, along with two other female manatees named Betsy and Electra. Ariel is large for a female manatee, tipping the scales at nearly 2,300 pounds the last time she was weighed. In the wild, manatees average about 1,200 pounds, and females are typically larger than males. Ariel is also a curious and playful manatee. She is also fond of popping her head up above the water to observe park staff when they are talking during the manatee education programs. Ariel and “the girls,” as they are known, spend their days exploring the spring run and watching the park visitors in the Fish Bowl underwater observatory. Ariel is an ambassador for all manatees, and when you adopt her, you are helping all manatees to survive. Each person who adopts Ariel will receive a full-color photo, biography, and adoption certificate, as well as a membership handbook and subscription to The Manatee Zone, a newsletter featuring updates on the adopted manatees when they are sighted, and Paddle Tales, Save the Manatee Club’s bi-monthly eNewsletter. For more information about adopting Ariel, go to Save the Manatee Club’s Adopt-A-Manatee page, or call 1-800-432-JOIN (5646). Brutus is one of Blue Spring’s largest manatees. He weighs in at almost 1,900 pounds and has been a regular winter visitor since 1970. Once you see Brutus, you aren’t likely to forget him. He is what you would call “one big dude,” topping out at nearly 1,900 pounds the last time he was weighed. One of the largest manatees at Blue Spring State Park, Brutus has been a winter visitor to the park since 1970, when he was first identified. During the winter season, Brutus regularly puts in a number of appearances at Blue Spring. He often likes to be off on his own, snoozing late on the east side of the spring run while all the other manatees are gathered on the west side. Brutus is available for adoption, and each person who adopts him will receive a full-color photo, biography, and adoption certificate, as well as a membership handbook and subscription to The Manatee Zone, a newsletter featuring updates on the adopted manatees when they are sighted, and Paddle Tales, Save the Manatee Club’s bi-monthly eNewsletter. For more information about adopting Brutus, go to Save the Manatee Club’s Adopt-A-Manatee page, or call 1-800-432-JOIN (5646). 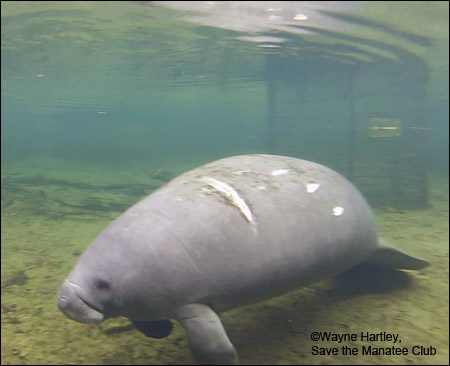 And be sure to watch for Brutus and other manatees on the Blue Spring webcams at ManaTV.org and read updates from Manatee Specialist Wayne Hartley. Deep Dent was an adult when he first appeared at Blue Spring State Park in the winter of 1979. It is unknown where he had wintered in previous years, but since 1979 he has come back to Blue Spring for many winter seasons. Deep Dent received his name based on the deep “dent-like” propeller wound in his tail. He has also received a similar dent-like wound on his head. In the summer of 2010, Deep Dent received another deep dent in the middle of his lower back, along with a section taken out of his tail. These scars make him easily identifiable and are a reminder that manatees are no match for fast-moving watercraft. Deep Dent is known to be a little bit shy. When park rangers come out in the early morning to identify and count the manatees, Deep Dent will sometimes swim away and lie very close to the far bank to avoid the research canoe. Other days, though, he doesn’t react to the approaching canoe at all – it seems to depend on his mood! Deep Dent can often be found alone, but this is not that unusual for manatees. They are semi-social, which means they are equally likely to be spotted alone or in the company of other manatees. Deep Dent is available for adoption, and each person who adopts him will receive a full-color photo, biography, and adoption certificate, as well as a membership handbook and subscription to The Manatee Zone, a newsletter featuring updates on the adopted manatees when they are sighted, and Paddle Tales, Save the Manatee Club’s bi-monthly eNewsletter. For more information about adopting Deep Dent, go to Save the Manatee Club’s Adopt-A-Manatee page, or call 1-800-432-JOIN (5646). 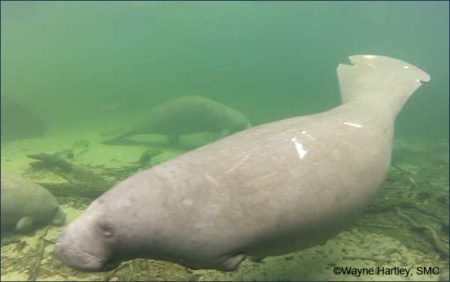 And be sure to watch for Deep Dent and other manatees on the Blue Spring webcams at ManaTV.org and read updates from Manatee Specialist Wayne Hartley. Doc usually makes several visits to Blue Spring State Park in the winter. Here he is on January 6, 2018. Doc first chose to make Blue Spring State Park his winter home in 1976. Since that time, he has returned nearly every year to spend the cold months enjoying the warm spring water. Doc is nearly 10 feet in length, which is average for an adult manatee. He weighs somewhere between 800 and 1,200 pounds, which is also the average weight for a manatee. He can easily be identified by the distinctive white scars on his back and sides and a notch in the left side of his tail. Doc frequently stays in the park area right up to the very end of the winter season. Sometimes he even stops by in the summer. His fondness for Blue Spring is evident in that he has been the attendance champion for several years, and one season he even put in 43 appearances! During the summer, Doc may wander far and wide or choose to stay near Blue Spring. One summer, he was spotted in Lake Dexter, which is accessible from the St. Johns River. It is relatively close to Blue Spring and DeLeon Springs State Park, where Doc has also been known to make an appearance during the winter. Doc is available for adoption, and each person who adopts him will receive a full-color photo, biography, and adoption certificate, as well as a membership handbook and subscription to The Manatee Zone, a newsletter featuring updates on the adopted manatees when they are sighted, and Paddle Tales, Save the Manatee Club’s bi-monthly eNewsletter. For more information about adopting Doc, go to Save the Manatee Club’s Adopt-A-Manatee page, or call 1-800-432-JOIN (5646). 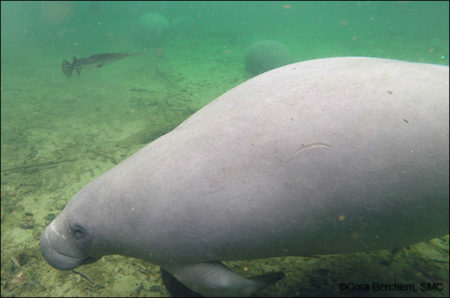 And be sure to watch for Doc and other manatees on the Blue Spring webcams at ManaTV.org and read updates from Manatee Specialist Wayne Hartley. When Gator was a young, juvenile manatee, he was captured on Save the Manatee Club’s webcam chasing and playing with an alligator at Blue Spring State Park during the winter of 2011-2012. From then on, he was known as Gator! Gator has quickly become a familiar manatee at Blue Spring State Park, and he tends to wander and play all over the spring run. 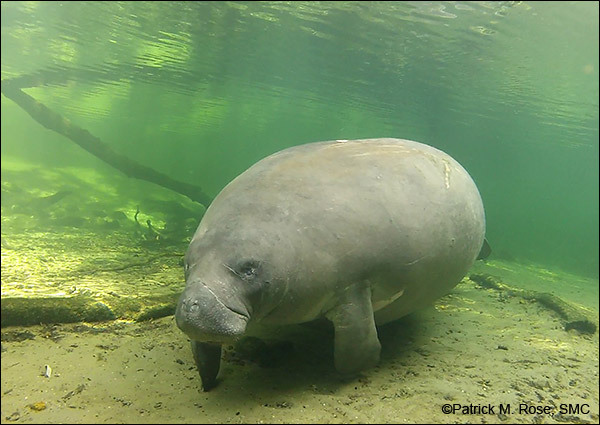 Manatees are found in freshwater, estuarine, and near-shore marine environments, along with alligators, and alligators are the only animals you will see in Blue Spring that can be as big as a manatee. People often think that alligators may be a threat to manatees, but an alligator has never been observed behaving aggressively toward an adult manatee. In fact, sometimes it’s the manatee that initiates the interaction. Curious manatees will follow the alligators around, while the alligators try to avoid them. That curious manatee would be Gator. Although the exact date of Gator’s birth is not known, it is believed he was among a group of unidentifiable yearling manatees seen at Blue Spring State Park, located in Orange City, Florida, during the 2010-2011 winter season. As the years have passed, Gator has continued to visit Blue Spring – often arriving early and leaving late for the season, which usually runs from November through March. His playful behavior is frequently noted, both by researchers and as seen on webcams located at the park. Gator has a very identifiable scar pattern, making him easy to spot. He has suffered a boat hit and has six large propeller cuts down his right rear side. Sadly, Gator was hit by a boat again at the end of January 2012, and his new scar consisted of three propeller cuts and a large skeg cut, almost in the exact same location as the previous scar. Gator is available for adoption, and each person who adopts him will receive a full-color photo, biography, and adoption certificate, as well as a membership handbook and subscription to The Manatee Zone, a newsletter featuring updates on the adopted manatees when they are sighted, and Paddle Tales, Save the Manatee Club’s bi-monthly eNewsletter. For more information about adopting Gator, go to Save the Manatee Club’s Adopt-A-Manatee page, or call 1-800-432-JOIN (5646). And be sure to watch for Gator and other manatees on the Blue Spring webcams at ManaTV.org and read updates from Manatee Specialist Wayne Hartley. Watch video of Gator at Blue Spring State Park, including footage where he hangs out with an alligator and follows it around! Lily (at left) on January 23, 2018 at Blue Spring State Park. Lily is one of the most well-known manatees at Blue Spring State Park. First recorded in 1974, she is a favorite with both park staff and visitors, and they look for her arrival each winter season. 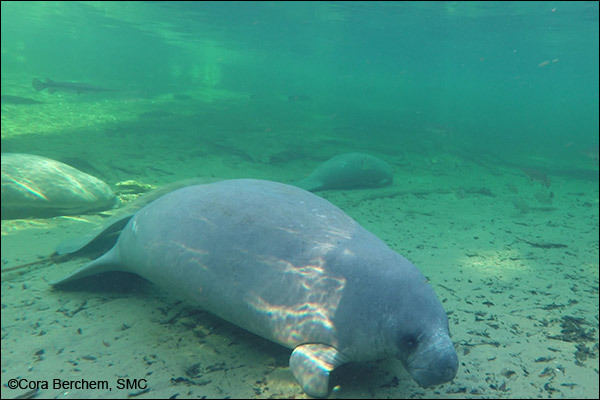 Lily is also well known as the matriarch of a fourth-generation manatee family at Blue Spring State Park. Over the years, Lily has had many calves of her own, and she is also a great-grandmother! Lily is easily recognized by several distinctive scars that she bears. One of the scars is on the top right side of her back and is left over from a skin fungus. Her other distinctive scars are located on her lower right side and are the result of a boat hit. Many manatees have preferred habitat they return to each year, and Blue Spring seems to be Lily’s favorite area. In fact, she has visited the park each winter since she was first identified, and she has been known to make anywhere from 20 – 35 visits per season. Lily is available for adoption, and each person who adopts her will receive a full-color photo, biography, and adoption certificate, as well as a membership handbook and subscription to The Manatee Zone, a newsletter featuring updates on the adopted manatees when they are sighted, and Paddle Tales, Save the Manatee Club’s bi-monthly eNewsletter. For more information about adopting Lily, go to Save the Manatee Club’s Adopt-A-Manatee page, or call 1-800-432-JOIN (5646). And be sure to watch for Lily and other manatees on the Blue Spring webcams at ManaTV.org and read updates from Manatee Specialist Wayne Hartley. Margarito lost his left flipper after it became entangled in monofilament fishing line. Margarito was brought to Blue Spring State Park for the first time by his mother, Lily, on November 24, 1984. At the time, it was estimated that Margarito was approximately five to six months old. He was named in honor of SMC Co-Founder Jimmy Buffett’s hit song “Margaritaville.” When the winter began, the plan was to name a calf “Margarita,” but when only male calves arrived, his name was changed to “Margarito.” By the following winter season, Margarito was weaned and on his own, and he has returned to Blue Spring every winter since. Margarito is known for being a very curious, friendly, and social manatee. He can be identified by a number of scars from watercraft strikes and from his missing left flipper, which became badly entangled in monofilament fishing line. Rescuers were able to remove the line, and they took him to SeaWorld Orlando for treatment before releasing him. Unfortunately, he lost the flipper, though he remains able to maneuver through the water using his remaining flipper and his powerful tail. Margarito is available for adoption, and each person who adopts him will receive a full-color photo, biography, and adoption certificate, as well as a membership handbook and subscription to The Manatee Zone, a newsletter featuring updates on the adopted manatees when they are sighted, and Paddle Tales, Save the Manatee Club’s bi-monthly eNewsletter. For more information about adopting Margarito, go to Save the Manatee Club’s Adopt-A-Manatee page, or call 1-800-432-JOIN (5646). 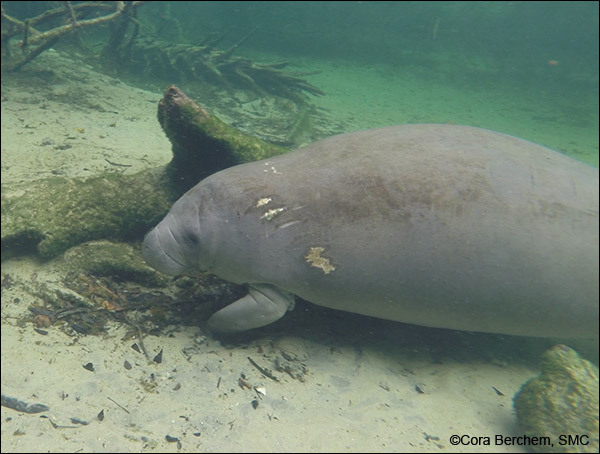 And be sure to watch for Margarito and other manatees on the Blue Spring webcams at ManaTV.org and read updates from Manatee Specialist Wayne Hartley. 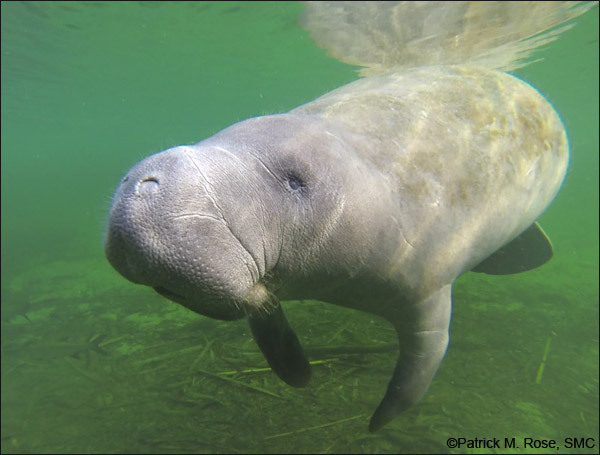 Paddy returns regularly to Blue Spring each winter and makes a number of showings at “manatee roll call,” when researchers travel the spring run in a canoe and count the manatees present. In fact, Paddy likes the area so much he has been known to stop by during the summer months as he cruises around the St. Johns River. Phyllis is a regular visitor to Blue Spring State Park and sometimes comes in the summer. In general, the reproductive rate for manatees is low. One calf is usually born every two to five years, and twins are rare. For this reason, it was very exciting when Phyllis arrived at Blue Spring on November 5, 1991, with not just one, but two calves! Her twin boys were named Bartram and Bertram after a famous Florida explorer of the nearby St. Johns River and a noted manatee researcher. Both calves are quite grown up now, and Phyllis has had several calves since that time. When her own calves are not keeping her busy, Phyllis regularly nurses other young manatees. This is not unusual, as female manatees will often look after and nurse the calves of other mothers. Phyllis is a regular visitor to Blue Spring during the cold winter months, and she often comes in more times than the other manatees. In fact, she has earned the title of “Attendance Champion” several times. From time to time, she will even come to visit the spring during the summer months. Phyllis is a playful, friendly manatee who likes to socialize with other manatees. Phyllis is available for adoption, and each person who adopts her will receive a full-color photo, biography, and adoption certificate, as well as a membership handbook and subscription to The Manatee Zone, a newsletter featuring updates on the adopted manatees when they are sighted, and Paddle Tales, Save the Manatee Club’s bi-monthly eNewsletter. For more information about adopting Phyllis, go to Save the Manatee Club’s Adopt-A-Manatee page, or call 1-800-432-JOIN (5646). And be sure to watch for Phyllis and other manatees on the Blue Spring webcams at ManaTV.org and read updates from Manatee Specialist Wayne Hartley. Rocket was so named because he had been known to “rocket” around the tank during his rehabilitation. Rocket was rescued as an orphaned calf at Blue Spring State Park in 2006. At the time, he was nicknamed “Tiny” because he was so small. He was taken to SeaWorld Orlando for treatment, where he was renamed “Rocket” because he had been known to “rocket” around the tank during his rehabilitation. When Rocket was released at Blue Spring two years later, he was a healthy 745 pounds and immediately rocketed around the run, living up to his name. Both Annie and Rocket have returned to winter at Blue Spring, although by now, they have gone their separate ways. After staying with Annie in the wild for a year and a half, Rocket went out on his own. He is still small for an adult male and will probably always be that way. Rocket is available for adoption, and each person who adopts him will receive a full-color photo, biography, and adoption certificate, as well as a membership handbook and subscription to The Manatee Zone, a newsletter featuring updates on the adopted manatees when they are sighted, and Paddle Tales, Save the Manatee Club’s bi-monthly eNewsletter. For more information about adopting Rocket, go to Save the Manatee Club’s Adopt-A-Manatee page, or call 1-800-432-JOIN (5646). 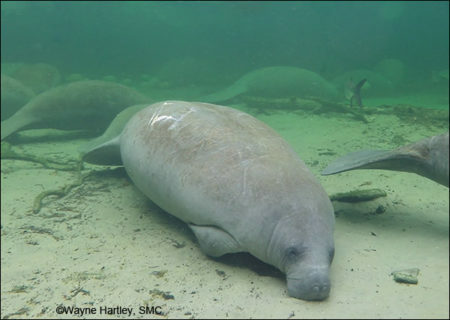 And be sure to watch for Rocket and other manatees on the Blue Spring webcams at ManaTV.org and read updates from Manatee Specialist Wayne Hartley. Whiskers on December 28, 2017 at Blue Spring State Park. Whiskers was first identified in November 1996 when he came to Blue Spring State Park with his mother, Dana, who was also in Save the Manatee Club’s manatee adoption program. Whiskers has a playful and curious personality, and he came readily to the research canoe for “manatee roll call” even as a calf. As Whiskers matured into an adult, that playful and curious personality stayed with him. He would still swim up the run with enthusiasm and was often one of the last manatees counted as he was busy playing. As he has gotten older, Whiskers seems to be settling down somewhat and is showing more maturity. Wayne Hartley, Manatee Specialist for Save the Manatee Club, calls him a “Tail-End Charlie,” because he has been known to arrive at Blue Spring a month or so after manatee season begins in November. Never an attendance champion, Whiskers typically makes anywhere between 10 and 12 visits to Blue Spring each winter. Whiskers is available for adoption, and each person who adopts him will receive a full-color photo, biography, and adoption certificate, as well as a membership handbook and subscription to The Manatee Zone, a newsletter featuring updates on the adopted manatees when they are sighted, and Paddle Tales, Save the Manatee Club’s bi-monthly eNewsletter. For more information about adopting Whiskers, go to Save the Manatee Club’s Adopt-A-Manatee page, or call 1-800-432-JOIN (5646). 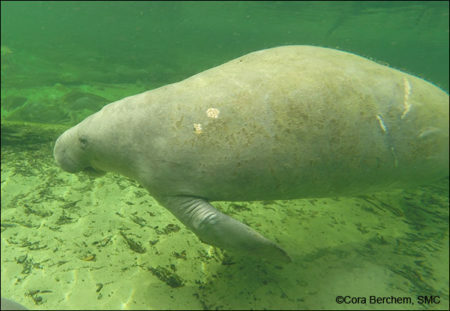 And be sure to watch for Whiskers and other manatees on the Blue Spring webcams at ManaTV.org and read updates from Manatee Specialist Wayne Hartley.